The name Fila Brasileiro means the 'holding dog' of Brazil, just as Perro de Presa Canario means the holding dog of the Canaries. The British equivalent would be the Bullmastiff, developed to seize and detain poachers here a hundred years ago. Brazil was a Portuguese colony from 1500AD, having been inhabited by American Indians from around 5000BC. Just as the Spanish conquistadores used savage dogs to quell native opposition during their forays inland, so too did the Portuguese. Such dogs were the alauntes, known on both sides of the Pyrenees and coming in three main forms: the huge hounds rather like today's Great Dane, the hunting mastiffs used in the hunt 'at the kill' rather on the physical lines of today's Bullmastiff and the smaller 'alauntes of the butcheries' rather like the original authentic Bulldogs of Britain. The Spanish conquistadores referred to three types: the alaunt, the mastin and the lebrel, a powerful greyhound type of hunting dog. Such dogs were trained as Perros de Ayuda or protection dogs and Perros de Presa or capture dogs. In parallel, the Portuguese in Brazil developed their comparable types and the breed of Fila Brasileiro eventually emerged. Undoubtedly, Bloodhound and Mastiff blood was used in this creation, and probably that of the ancestors of the contemporary Portuguese flock-guarding breeds, such as the Cao de Castro Laboreiro, the Estrela Mountain Dog and the Rafeiro do Alentejo. The Azores has recently seen the re-establishment of its surviving holding dog, the Cao de Fila de Sao Miguel. 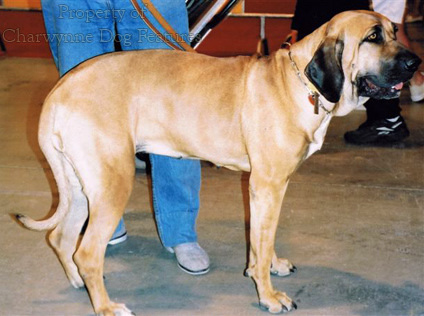 The Filas Brasileiro which I have seen at a number of World Dog Shows seem to vary in type: the black ones, and some of the fawns, indicating Great Dane blood, the brindle ones hinting at Mastiff ancestry and the red fawns looking a little Bloodhoundy. But, importantly, all of them looked, as all historically correct mastiff breeds should, like heavy hounds. The British enthusiasts who made the mastiff of England into a ponderous, cumbersome, heavy-boned, inactive yard-dog at the end of the 19th century have a lot to answer for. A huge dog needs soundness of physique more than a small one if it is to lead a healthy active life. A heavy dog needs sound movement more than a lighter one if needless wear and tear is to be avoided. It is vital therefore when this breed is judged in the show ring, for it to be viewed as a working animal, possessing an anatomy which permits this. This breed is still used as a hound and a cattle dog, as well as a greatly-respected guard dog. Used as a tracking dog during the colonial period, it was used to pursue and detain runaway slaves from the vast sugar cane plantations. At the Brazilian army's Centre for Instruction for Jungle War at Manuas, Colonel Moniz de Aragao has been testing this breed for some years as anti-guerrilla dogs. Having myself used Labrador Retrievers and German Shepherd Dogs in the Malayan and Borneo jungles, I know only too well how such work can be a severe test for any breed. In Canada, Copeland and Alice Shavers have been testing the breed for the demanding Schutzhund training and found it superb. A Fila has a strong instinctive guarding nature; it is strong minded, watchful, protective and just will not tolerate a threat to its family or property. A huge dog that is docile, obedient and devoted to its family, but is naturally aggressive towards strangers, may not be welcome in contemporary Britain, where criminals seem less likely to be prosecuted than the owner of an alert guard dog, but is invaluable on isolated estates and ranches in Brazil. This breed is not just valued as a guard dog in its native country. In Minas Gervais, believed to be where the breed originated, it has gained a reputation as a cattle dog. Used to round up semi-wild cattle, the Fila -- in classic holding dog manner -- can seize recalcitrant bulls by the ears or cheeks, until the herdsmen move in. The Filas also protect the herd from predators and rustlers. A large dog, males weighing at least 110lbs and measuring 27" at the withers, the Fila is a strongly-boned dog, hinting at great power. With a sizeable head and a substantial jaw, scenthound ears and dewlap, thick loose skin and a distinctive deep bark, the breed displays a formidable physical presence. Coat colours are the solid colours, black, fawn, red, plus brindle but not mouse-grey or white. Some experienced dog breeders will be surprised to find the lighter-bone and limited angulation in the hindquarters and the tendency for this breed to be higher at the croup than the withers. This gives the breed its distinctive rolling gait and 'camel' pace, reminiscent of the Neapolitan Mastiff. The Fila is however a good jumper, an excellent swimmer and remarkably agile for its size. The breed has been used to hunt jaguar and wild boar; it displays surprising stamina and seems able to withstand humidity and stinging insects. Clelia Kruel, an experienced Brazilian breeder and judge, has stated that the greatest value of this breed lies not in its handsome appearance or impressive stature but in the unique character of the dog. Despite being a tough breed they are not difficult to train, needing little training to be guard dogs. Vincent Tucci, a New York breeder, values the serenity, self-assurance and air of relaxed calmness found in the breed. This came into my mind recently as I watched an English Mastiff displaying worrying shyness in the ring. In the United States, the Fila has been used for protection work by the police, capitalising on the breed's size and instinctive guarding skills. A test of temperament is compulsory for all Filas, after reaching one year, before they can be registered as champions. These tests are conducted at breed speciality shows and examine self-assurance, resoluteness, steadiness under fire (blanks are fired five yards away from the dog to simulate this) and protective instincts. Some breeders of other large guarding breeds are apt to scoff at such an examination, forgetting that the most unpredictable untrustworthy dogs are those which bite out of fear, the dreaded 'angstbeissers'. The breed standard emphasises the manifestation of temperament desired in the breed, requiring an expression which in repose is calm, noble and full of self-assurance, never disclosing a bored or vacant look, appearing determined when alert and featuring a challenging look in the eyes. A short muzzle, excessively light-coloured eyes, wrinkles on the skull when in repose and a lack of chest depth are considered to be serious faults. A pronounced stop, timidity, straight or cow hocks and excessive height (i.e. over 75cm for males, 70cm for females) are rated as very serious faults. Cowardice, a pink nose and a faulty mouth, either over or undershot, constitute disqualifying faults. An American farmer, Dexter Brunette, who runs 180 head of cattle at Barnesville, bought a Fila as a companion guard but soon found it was a natural cattle herder. His dog now works daily and yet has gone on to become a champion in the USA, Puerto Rico and South America. It is easy to forget the shepherds' mastiffs of England until hearing of the prowess in one of the mastiff breeds like this. The shepherds' mastiffs were big, tough, drovers' dogs, able to protect the herd or flock on the driveways to urban markets or to pin wayward cattle in the market or for the butcher. The mastiff breeds are working dogs and must have a construction and temperament which permits this. Dawna Berg, of Arlington, Washington, in the United States, from her successful Eshabeta II kennel, speaks highly of her Filas' instinctive guarding qualities based on devotion to family and family property. 'As faithful as a Fila' is a Brazilian saying, a result of a hard earned reputation. Their faithfulness is now as famous as once was their ferocity. The Varners, in their book 'Dogs of the Conquest', recount how in Florida, "De Soto and his men made impressive use of their dogs...Hearing the Spaniards shouting and seeing the Indians fleeing, Bruto (De Soto's personal dog) set out in pursuit. He dashed past the first three Indians and, throwing his paw on the fourth one's shoulder, knocked him to the ground. Successively knocking each of the others down, he went back and forth among them and, with much skill and trickery, prevented them from rising, frightening them in the meantime with his ferocious barking..."